Explanation: The center of galaxy NGC 1808 is bursting with new stars, but why? Being a barred spiral galaxy makes NGC 1808 somewhat similar to our own Milky Way Galaxy. 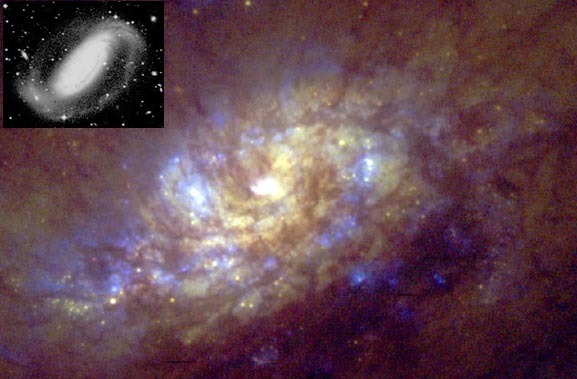 But the disk of NGC 1808 (inset) is quite warped, and its center is unusually bright and blue. The above picture of NGC 1808's center, in representative color, was recently taken by the Hubble Space Telescope and released yesterday. Perhaps gravitational pull from a recent pass of neighboring galaxy NGC 1792 has caused matter to move inward along NGC 1808's bar, triggering the burst of star formation. Also prominent are blue clusters of stars and filaments of dark dust obscuring even more activity.